OH, OH, OH WHAT A LOVELY SUMMER! And we don’t just mean the weather! The Tars summer got off to a flying start in Falmouth and then just kept getting better. 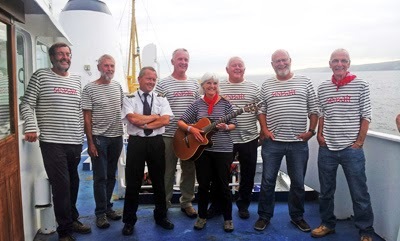 On the 29th June we were at Vauxhall Quay on Plymouth’s historic Barbican, entertaining the delegates at the annual Global Conference of the Society of Economic Botanists, who were meeting at Plymouth University. We are still unsure about what Economic Botanists do, but we can report that they are keen to dance! Lovely people. 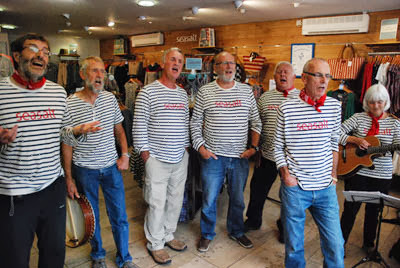 Only a week later (Sunday 7th July) we were in Teignmouth for the South Devon Sea Shanty Festival. For many of us, this was a first visit to Teignmouth, which was charming, and a surprise if your only previous knowledge of the town is the view from the window of a First Great Western train heading for Paddington, which doesn’t flatter. We performed in three locations in the town, in glorious sunshine, and were delighted to have Beth Barnes with us for the day. Beth played with us for about six years (the youngest shanty crew member in the West) but called it a day last year as she needed to concentrate on her GCSEs. She will be off to Exeter for the next stage of her education, but hopefully we will be able to link up again whenever she is at home. 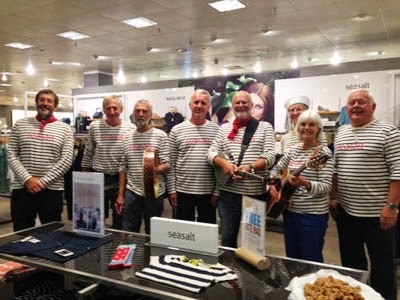 Our next big adventure was a trip to Southampton where our good friends at Seasalt had asked us to perform at their shop in the impressive John Lewis store. We were amazed that a department store could make such a good venue, but this John Lewis has “a hole in the middle” so we could sing into the atrium and apparently be heard on every floor. We got great feedback from customers and staff alike, and heard afterwards that Seasalt sales on the day went up by 74%! 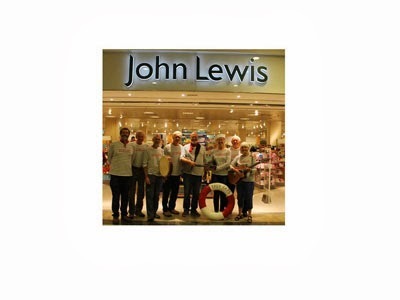 A special thanks from the Tars to everyone at John Lewis and to Charlotta at Seasalt who did all the organising and was the perfect companion during the trip. On the 14th August we achieved another landmark. 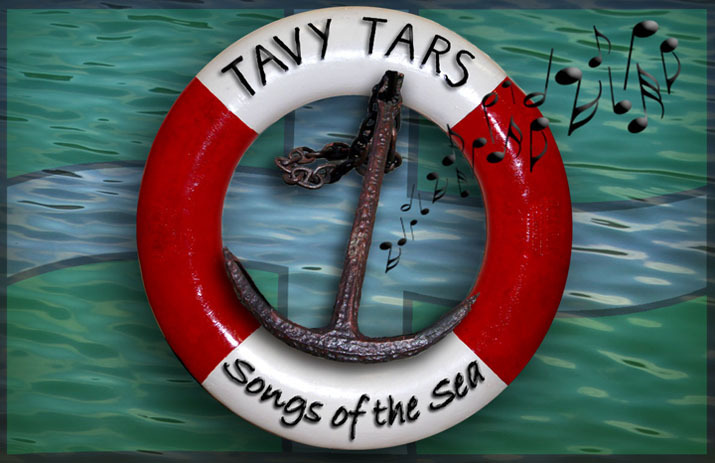 We have sung on plenty of ships before, including Brunel’s s.s “Great Britain” in Bristol, but they have always been safely alongside or in dry dock .This time, the Tars finally took to the high seas and performed on a ship under way in the Western Approaches. The ship was the RMS “Scillonian” on her daily service from Penzance to the Isles of Scilly, and the occasion was a fundraiser for our friends at the St Germans branch of the RNLI. The “Scillonian” turned out to be a super venue, the collection went well, and the passengers, who probably don’t hear a lot of shanty singing, were enthusiastic. And to top it all, we were able to drop in on the Seasalt shop in St Mary’s and surprise the customers. Most importantly, there were no disgraces for us salty Tars. We all held on to the contents of our stomachs during the crossings. We have also had a short summer break but are now back at it. 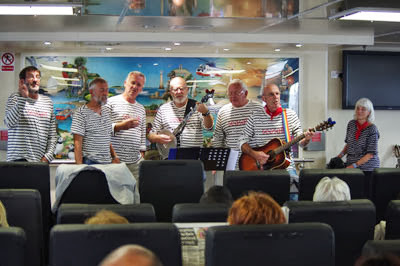 We have a couple of Trafalgar Night gigs booked for October, together with the annual Bere Ferrers Apple Festival (when you hear us singing about cider rather than ships sinking).But our main focus right now is the new CD which we hope to be recording in November.